A first-of-its-kind panel charged with providing outside insight to NIU’s admission and recruitment measures visited campus for a kickoff conference Friday, April 5. NIU’s newly formed Counselor Advisory Board comprises representatives from mostly Midwestern high schools, junior colleges and community-based organizations. Members commit to a two-year term — with committee meetings planned each fall and spring semester. In addition to offering perspective on NIU’s practices, the group of roughly two dozen secondary and higher education professionals will contribute to an annual report for the President’s Office. 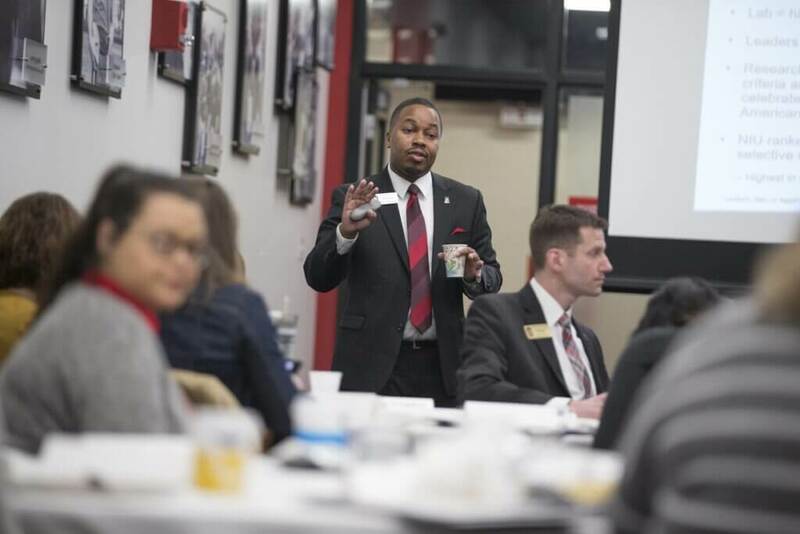 Director of Admissions Quinton Clay addresses attendees of NIU’s first Couselor Advisory Board meeting on Friday, April 5, 2019. Twenty members of the 25-person board — some from as far away as California and a handful of Huskie alumni — spent more than 12 hours becoming acquainted with NIU at Friday’s gathering. Before touring campus with Northern Ambassadors and diving into four breakout sessions, the group heard from such internal speakers as Dean of Students Kelly Wesener Michael. They also attended the keynote address of the Collegiate Association of Unreasonable Social Entrepreneurs’ Social Impact Summit concurrently taking place Friday at NIU. Clay co-presented an overview on NIU and the panel’s mission with Vice President of Enrollment Management, Marketing and Communications Sol Jensen, and also shared highlights of the Strategic Enrollment Management Plan. Clay echoed those sentiments, noting that he didn’t even cover all of his slides at a recap presentation because of the “robust conversation” spanning academics, marketing and student support strategies, as well as industry and competitor best practices. The Counselor Advisory Board will help produce this year’s annual report after returning for its next visit to NIU’s campus, slated for the fall 2019 semester.